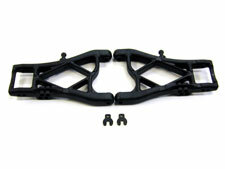 I got the rear arms some weeks ago but since I have had no place to practice all the testing was done at a carpet race. The first thing you notice when you see the new arms is that they are much beefier than the stock arms. They have 4 different holes for the shock (2 upper, 2 lower) and the wheelbase is adjustable. The shorter wheelbase setting is still a little bit longer than with the stock arms and the longer wheelbase setting makes the wheelbase approx. 263mm. They also have a molded ball stud for the roll bar. They will also make the car slightly wider. The new arms flex a lot less than the stock composite arms. Therefore they will give the car more rear end grip than the old ones. I also found the wheelbase adjustment possibility very helpful as you can change the feeling of the car really easily by just moving the spacer. By moving the hubs rearwards for a longer wheelbase you also "move" the weight forward. So while the longer wheelbase makes the car more stable you also get more weight on the front, which will give more on power steering. Overall I'm very happy with the new rear arms. In a back to back test with the old ones they definitely improved the car, at least on that track. They made the car a lot easier to drive so just go ahead and try them. They're well worth it.